This Pendant is a work of art! 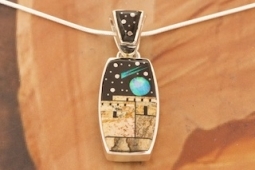 Stunning Starry Night at the Pueblo Design featuring Genuine Picture Jasper and Acoma Jet inlaid in Sterling Silver. Beautiful Fire and Ice Lab Opal Moon and Shooting Star! The reverse side features an extraoridinary design with Genuine Picture Jasper, Red Jasper, Wildhorse, Acoma Jet and White Agate. Free 18" Sterling Silver Chain with Purchase of Pendant. Designed by Navajo Artist Calvin Begay. Signed by the artist. Be sure to click on the second photo to see the reverese side. Pendant is 1 1/2" long including bale x 5/8" wide x 3/8" deep.